The Fusion Payable Staged Network (PSN) launch is quickly approaching. Fusion is excited to share a first-look at the NEW Fusion Wallet interface! The wallet interface is one of the gateways for users to experience the innovative functions on the PSN. This article will explore the Fusion Wallet features including the revolutionary Quantum Swap function. The Fusion wallet is the central place for users to execute P-FSN token transfers, time-lock assets for loaning, swap assets using quantum swap, buy tickets for staking and more. For the purpose of PSN, Fusion adapted the My Ether Wallet (MEW) interface, a trusted, open-source wallet as the basis for the Fusion Wallet. The wallet selection was based on MEW’s open-source code, security parameters, and reputation. By amending the original code and adding additional commits, Fusion satisfied the requirements for PSN usability while maintaining a high level of security. The Fusion Wallet parallels MEW in security, common functionalities, plus look and feel. The purpose of using a trusted and familiar wallet like MEW is to give users the confidence that their digital assets are secure and limit the learning curve with a familiar interface. For technically inclined community members, the open-source code will be made available. Users can dive into the Fusion Wallet code and explore the ingenious ways Fusion adapted MEW’s source code including the extra functionality: time-lock, quantum swap, staking, and more. The majority of the relevant information is contained and managed via the dashboard screen. Balances across different tokens/coins, the user’s public address, transaction history, asset creation function, language specification, Universal Short Account Number (USAN) and time-locked asset status. Time Locking and Sending Assets, We Made it Handy! The send assets screen allows users to time-lock assets and/or send assets. Indicate a recipient’s address, the asset to be sent or time-locked and sent, user’s asset balance, amount, gas, dates (including expiration), and totals. Quantum Swap is a new technology developed by Fusion. The majority of crypto wallets use one of three mechanisms to achieve a swap or an exchange. Let’s briefly cover the advantages and disadvantages of these existing technologies. Atomic Swap: Many wallets rely on Atomic Swap (AS) technology for exchanging tokens from a wallet interface, or via smart contract. AS requires token support, so not all tokens are able to be swapped using AS technology. AS is at the very least a two-step process where channels must be opened between both parties. Parties must approve the exchange and the exchange must happen within a given time period. If both parties fail to validate the exchange in time, the funds are returned to each party. Often times in an unresolved exchange there’s a lag in funds being returned. A common criticism of AS is that the exchange doesn’t happen simultaneously (ledger booking time is required) so some believe this is a “slow” process. Atomic Swap is best used for single currency payments. A great example is the second layer payment scaling solution, Lightning Network. ShapeShift: Another underlying exchanging technology leveraged by many wallets is ShapeShift. Shapeshift requires a deposit of the tokens to be swapped to the ShapeShift platform. When tokens are deposited the user has the option to accept a “quick” or “precise” exchange rate offered by ShapeShift. While no additional fees are collected for the transaction, the user must accept the exchange rate options offered by ShapeShift. Unfortunately, ShapeShift suffers the same token support limitations as AS, so not all tokens are supported. ShapeShift transactions are not immediate, so users must wait for the transaction to clear. Exchange Connected Wallets: Some wallets are connected to exchanges so some token holders use this this solution for token swapping (typically for arbitrage trades). Exchanges vary in terms of domicile, and degrees of centralization. When using exchanges to swap, users are often limited in terms of token pairings that can be exchanged, the exchange rate of the platform, and additional transaction fees. When using exchanges, it’s often highlighted that due to their centralization exchanges are susceptible to security breaches. In general exchange connected wallets are geared for trading and aren’t a solution for exchanging multiple types of digitized assets peer-to-peer. 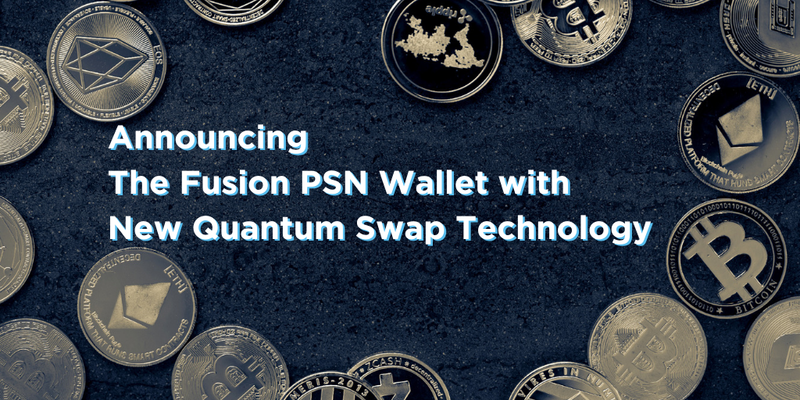 The Fusion Quantum Swap (QS) is a new technology enabling swaps and exchanges offering increased flexibility and speed for peer-to-peer transactions compared to existing wallet mechanisms. Multiple asset support. Once a digitized asset is locked onto the Fusion Network, any digitized asset, token or coin is supported, meaning any asset can be freely exchanged. One-step transactions. QS eliminates multiple step exchange confirmations. Freedom to determine swap or exchange pairs. Users define the assets to be exchanged without pairing limitations. Users set their own terms. No interference from centralized parties or processes setting rates, it’s purely peer-to-peer. The power is in the hands of the counter-parties. Immediate transactions. Once a user posts a “make swap” offer and the counterparty accepts (“take swap”), the transaction executes. The transaction is logged into the decentralized, immutable Fusion Network ledger. From the Make Swap Screen, users determine the exchange pair, rate, can view balances, time-lock assets to be exchanged, set minimums, timeframe, and determine whether the offer is public or private. Automatically an offer will be cancelled and removed from the queue if the offer expires. The Quantum Swap Marketplace displays all the available swaps that have been broadcast to the public. A user can execute on any swap within the marketplace given the requisite asset amount is in the user’s wallet. A user does not have to take the full amount of the swap or exchange, so partial fills are an option. The swap-maker can set minimum exchange limits. Acting as the tracking interface for all open exchange offers, The Open Makes Screen displays all of the available swaps that a user has broadcast to the public or sent privately to a specific address. Open offers can be recalled at any time prior to full execution. The Make Offer dashboard information includes: offer date, amount sent, received, rate, minimum limits, swap status (partial fill stats), and recall actions. The Fusion Wallet with Quantum Swap functionality is a big step forward for wallet technology that spans beyond crypto asset management. With immediate, peer-to-peer, multi-asset support for time-locked and standard asset swapping, the Fusion Wallet marks the new standard for exchanging digitized assets.